The following descriptions of the village of St. Nicholas are taken from 'A Topographical Dictionary of Wales'. "NICHOLAS, ST., in the Cwmwd of Is Caeth, Cantref of Brenhinol (now called the Hundred of Dinas Powys), County of GLAMORGAN, South Wales: a discharged Rectory valued in the King's Books at £11..10..0: Patron, The Hon.William Booth Grey. The Resident Population of this Parish, in 1801, was 319. The Money raised by the Parish Rates, in 1803, was £140..7..7, at 1s. 7d. per acre. It is 6 m. W. from Caerdiff. The Fairs, for horned Cattle and Sheep, are holden on the 19th of May, 21st of August, and 19th of December. This Parish contains about 1900 acres of cultivated Land, and about 100 acres of Underwood. It is situate on the Turnpike Road, between Caerdiff and Cowbridge. The present worthy Rector, The Rev. DAVID THOMAS, most obligingly adds, "There is an House adjoining the Church-yard, which is kept in repair at the expense of the Parish, and wherein poor People live: it appears to me, on its first Institution, to have been either a Chantry, or an Alms-house. At the distance of a quarter of a mile, in a Field on the South side of the Village, there is a very remarkable stone, measuring in length 24 Feet and in breadth 10 feet, erected on others about 6 feet high, and so constitutes a spacious Room: I judge it to be a Druidical Temple: it has a Mound raised round it, except in one place where you enter. On the North side of the Village, at an equal distance, there are the remains of a Roman Camp. "-The Petty Sessions for the Hundred of Dinas Powys are holden here. 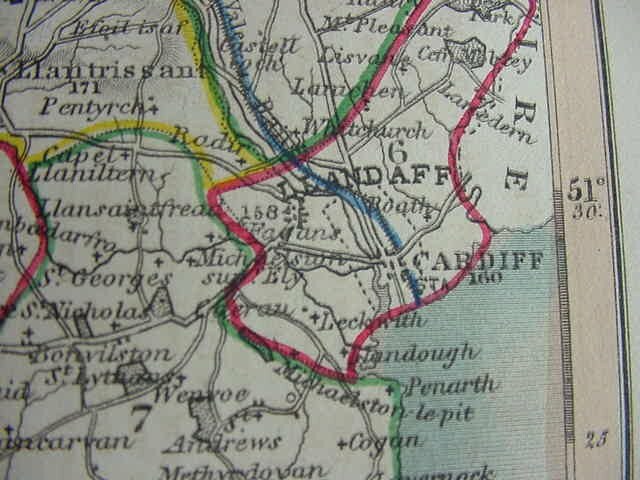 NICHOLAS' (ST.), a parish, in the union of Cardiff, hundred of Dinas-Powys, county of Glamorgan, South Wales, 6 miles (W. by S.) from Cardiff; containing 425 inhabitants. 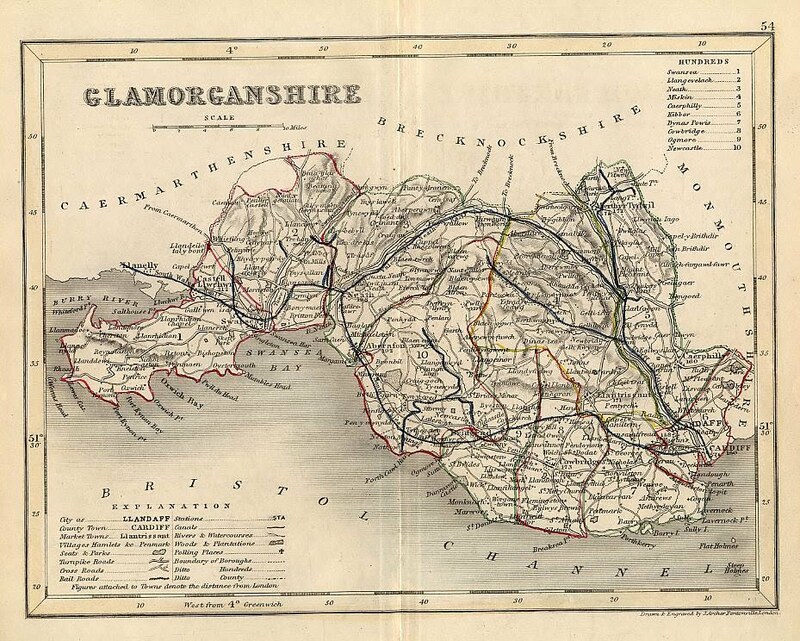 This parish, which takes its name from the dedication of its church, is situated on the turnpike-road from Cardiff to Swansea, and comprises a considerable tract of arable and pasture land, the whole, with the exception of only a small portion, inclosed and cultivated. The soil is in general fertile and productive; the surrounding scenery is pleasingly varied, and in some parts picturesque. Dyfryn House, in the parish, was formerly the seat of the ancient family of Pryce, and afterwards, by marriage with the heiress of that family, the property and residence of the Hon. William Booth Grey, and, on the death of Mrs. Grey, of her relation, John Bruce Bruce, Esq., who has taken the name of Pryce. It is agreeably situated in a retired spot, about a mile southward from the village; the grounds are tastefully laid out, and comprehend a pleasing variety of scenery. Cottrel, the residence of Capt. Sir George Tyler, R.N., to whom it reverted on the death of the late Earl of Clarendon, is also pleasantly situated, and commands from the rear of the house a fine view of the picturesque Vale of Ely, with Hensol Castle and the grounds attached to it on the western bank of the river. Fairs, chiefly for cattle and sheep, are held in the village on May 19th, August 21st, and December 17th; and the petty-sessions for the hundred are also held at this place. According to the Annales Marganenses, printed in Gale's Scriptores, the town or ville of St. Nicholas' was burned by the Welsh in the year 1226. The living is a discharged rectory, rated in the king's books at £11. 10.; patron, John Bruce Pryce, Esq. : the tithes have been commuted for a rentcharge of £210, and there is a glebe of fifty-six acres, valued at £59 per annum. The church is an ancient and venerable structure, with a tower at the west end. There are places of worship for Baptists and Calvinistic Methodists; a Church day school; and three Sunday schools, one in connexion with the Established Church, and the others belonging to the Calvinistic Methodists and Baptists. On the right of the road leading from the village to Dyfryn House is a cromlech, said to be the largest monument of the kind in the kingdom. It consists of five upright stones, inclosing an apartment seventeen feet in length and thirteen in breadth, upon which rests a sixth or table stone, twenty-four feet long, and varying in breadth from seventeen to ten feet. The apartment is inclosed entirely on the east, west, and north sides, but is open on the south; the five supporting stones are flat, of unequal length, and now much diminished in apparent height by the accumulation of rubbish. In a field by the road-side, immediately opposite to Cottrel Lodge gate, is a single stone of the same origin, lying in an inclined position. Indeed, many parts of the neighbourhood are studded with Druidical remains; Dyfryn, Mr. Bruce Pryce's seat, being distinguished from other houses of the same name, as Dyfryn Golych, or "the vale of worship." A large number of human bones were found in February 1847, at the Doghill farm, in the parish, in graves cut deep in the lias rock.